Where can you find a Mesa Restaurant that has remarkable food from around the world? Anything near Mesa in the SE Valley of Phoenix? Do you ever watch travel shows on cable where the beautiful people eat in fabulous foreign countries? Just think about the wonderful world foods that are waiting for you. Right here in the SE Valley. Sometimes you dream of going to Europe of Asia for just a few hours. Maybe Mexico. But without the hassles. So what do your do? Step out of your comfort level just a wee bit and check out a new world food restaurant. Live a little on the wild side. At the same time you want a good adventure. That’s why this guide is here for you. Think of it this way. Tour the world right here in the SE Valley! Maybe you are on a “staycation.” Since gas is expensive, a staycation is a great way to enjoy foods from around the world while you stay at the home hotel. Visiting? Well here are some picks for remarkable restaurants that feature foods from Mexico, Germany, Italy, etc. These Mesa restaurants are picked because the food is just fabulous. Maybe they are located in a drab part of town but don’t let that fool you. After all, some of the best eats in the world are located in rather ordinary neighborhoods. The value is in the food rather than a fancy extravagant building. How about a German restaurant? The Bavarian Point Restaurant is known to the local regulars. To visitors it can be hard to find. Click on the link or picture below for a description and map. Here's an Italian restaurant that specializes in thin crust pizza named Vito's Pizza Place. They offer all kinds of Italian food in case you want more than pizza. Then there is a cozy place in downtown Gilbert called the Euro Cafe. Do you have a craving for something in the Greek to Mediterranean style, maybe with a European baked dessert? You can get a casual lunch to a fancy dinner with wine here. How about a Restaurant known for quality authentic Italian food? Used to be near HoHoKam Park and moved to Tempe. 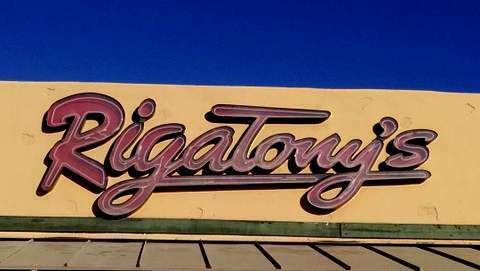 You will love Rigatony's.